Product #21255 | SKU 883955 | 0.0 (no ratings yet) Thanks for your rating! The 18-250mm F3.5-6.3 DC Macro OS HSM has been built with Sigma's exclusive Optical Stabiliser (OS) function. This provides approximately 4-stops of effective camera correction, allowing for lower-light shooting, or greater sharpness in adequate lighting situations. This benefit is even carried into the macro range of photography, where the slightest bump or blur could easily ruin an image. This stabiliser is also adaptive to moving subjects, detecting your movement as you pan the camera and lens, offering effective correction there as well. 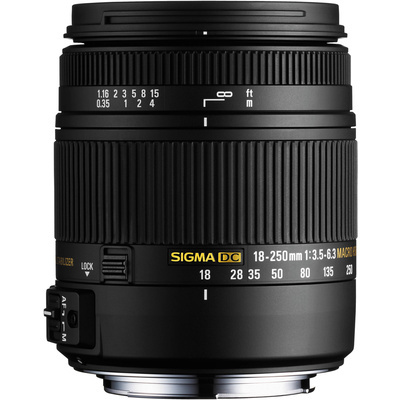 For a lens that offers a wide-angle to telephoto focal length, the ability to zoom-in with macro photography, and provides Optical Stabilisation built-in, Sigma's 18-250mm F3.5-6.3 DC Macro OS HSM made for Nikon cameras is more than a match. Whether you're on a macro product shoot, a walk in the park, or have a wedding to go to, this lens will help you shoot high quality images in any situation.